MNC – Manchester Neurotherapy Centre has a large treatment area that can be screened for privacy, or opened-up to make a large open-plan area. The clinic is also used by the Neurological Teaching Centre for neurological courses and workshops related largely to Neurological therapy and Neuroscience. There is also a separate treatment room, where more privacy or a quieter environment is required. MNC has a partial body weight support treadmill system which is used for individuals, including those with spinal injury, who need support in order to explore their potential to walk in a safe environment. The centre has specialist “Bobath 5″ plinths for treatment, the design of which, the directors of MNC were involved in. They can be adapted in a variety of ways to fit the treatment plan and are particularly suitable to Bobath physiotherapy. 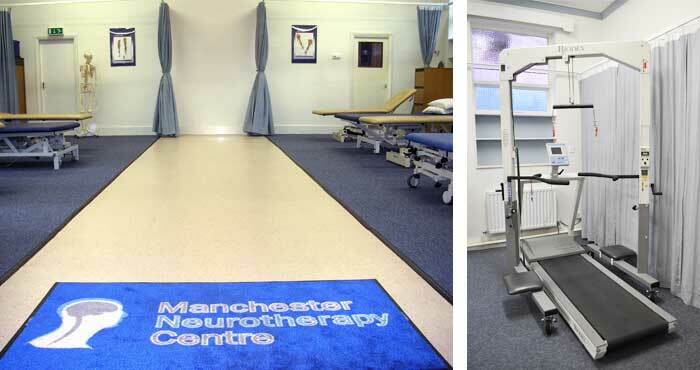 Manchester Neurotherapy centre is fully wheelchair accessible, with disabled parking at the front of the clinic, and disabled toilet facilities. Tea and coffee facilities are available without charge for patients and their carers. MNC has access to a specialist hydrotherapy pool fitted with ceiling track hoist throughout the hydrotherapy pool area to assist with preparations and entry to pool if required. Specialist equipment to aid floatation and resistance during treatment in the pool is also available.